I have some extra preppies at home I can play with, and a whole list now of the pigments I want to try out :3 I'm going to go with my basic interference colors (colored mica, essentially), some color-shifting mica, and then see if the one I have that I never got to work in polish - one that's just bronze powder and silica - will work in this! If it does, man, I'm gonna have ALL the sparkles! For what it is worth, the Preppy is not easy to clean out. It looks amazing. I have been thinking about doing the same thing with green ink. 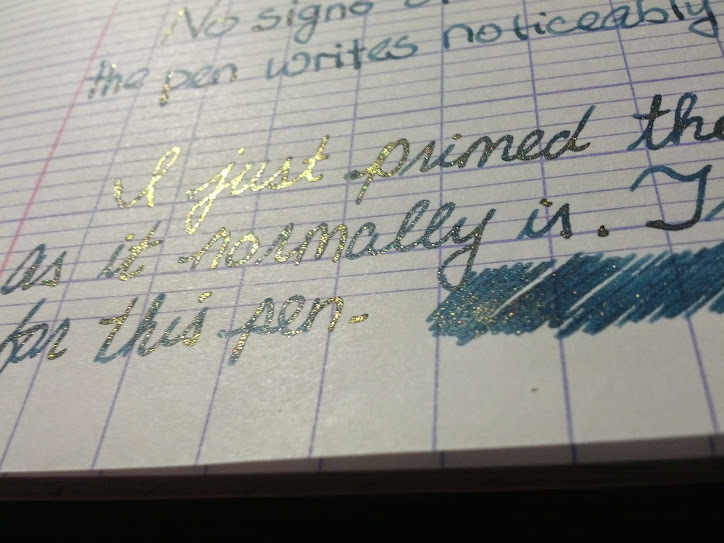 Please keep us updated on how the gold affects the pen. Yes! Since I have the powder, I was thinking the same thing. Hmmm, gold and black? Silver and blue? Green and bronze? I was just thinking about this, too, having gotten a letter written in Sailor Grenade. I knew there was a reason to keep some cheap CC pens lying around. When I find my powders, I may be willing to share/trade. Edited by Sailor Kenshin, 09 November 2014 - 16:24. 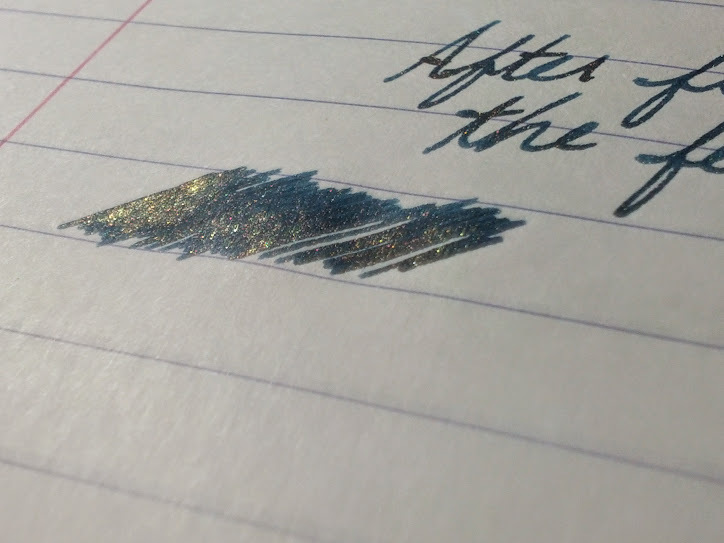 Blue is my favorite ink color - I think silver (or maybe even blue flecks) would look pretty sweet. I currently have my Baoer nib down and will test it with pictures later on this evening. Assuming it does not fully clog, anyway. 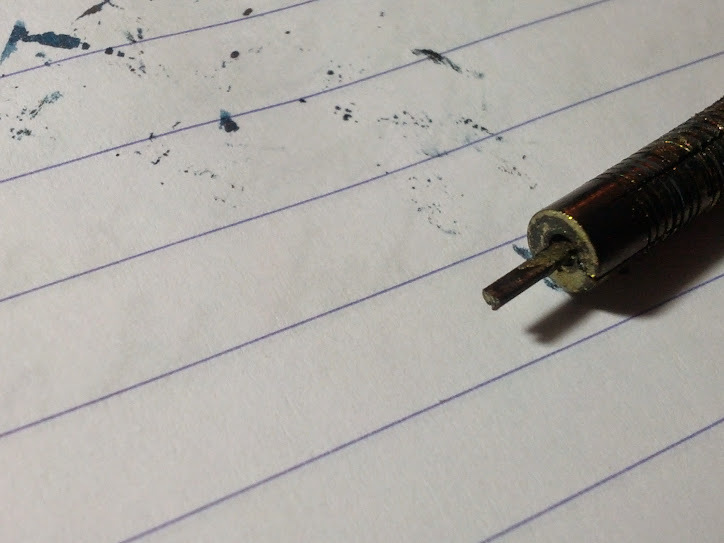 If that does not clog the pen, I'm doing to leave it nib down with the cap off for a day or so so that I can see whether or not dried ink/gold will wash out. If that goes well, I'm going to throw some into a Noodler's pen and not worry about it since I can replace the feed on those. We (I) eagerly await your results. Thank you for doing this! 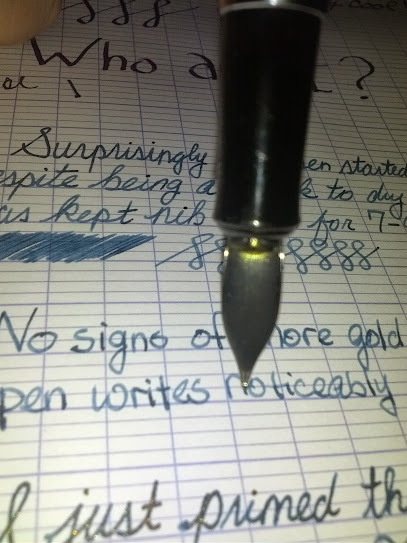 The pen (Baoer 508) was left capped and nib down in a pen holder for somewhere between 7 and 9 hours. I tried to maintain the C/C and section vertical during the entire test so that gold was not mixed at all. Inspection of the converter revealed gold settling at the bottom. This was no surprise as you can see it happen in less than 2 minutes after shaking the bottle of ink mix. The picture below is difficult to see as the amount of powder relative to the C/C size is pretty small. Gold residue can also be seen around the piston, which I had not noticed initially. Quite a bit of gold settling can be seen on the thingamabob that connects the converter to the feed also. Despite a lot of buildup, the tube looks unobstructed. Initial writing was dry (for this pen) - something along the lines of a Lamy Safari's dryness. 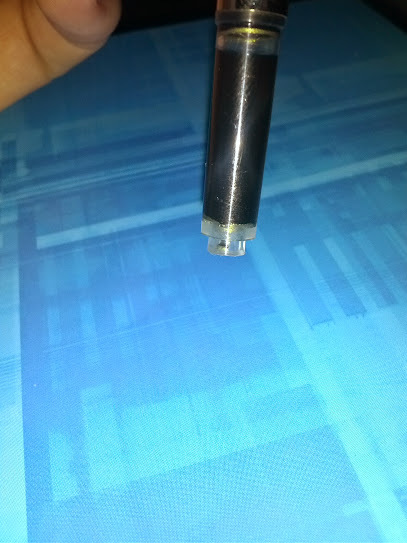 Stingy ink flow, but no skipping issues. It was wet enough for some nice shading. The gold distribution was surprisingly even. I had expected the feed to become heavily saturated with gold powder. My suspicion is that the gold settles onto the fins of the feed and gets caught without a steady flow of ink. This could be exacerbated by the pen's tendency to dry out quickly, but only an examination of the feed will reveal this theory. The text to the right of the page are also nicely flecked with gold, but the camera only captures a small portion of sheen relative to the low lighting at this time of day. Standard practice for this pen is to saturate the feed to start it up. 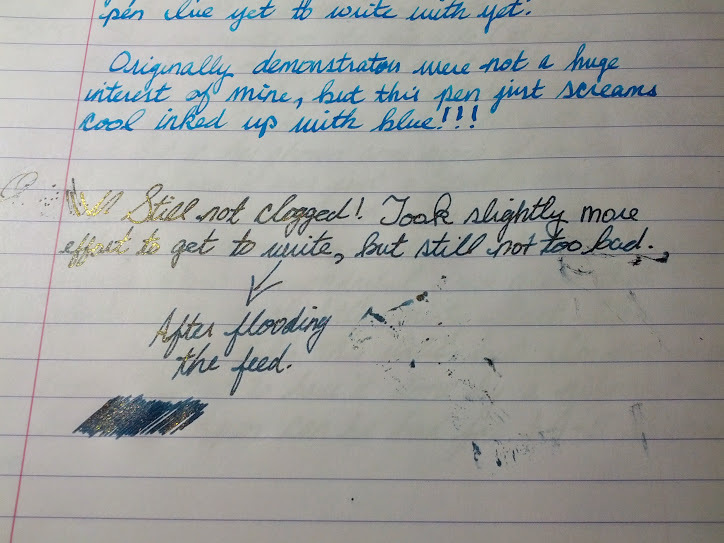 The pen wrote very wet, as normal, after flooding it and then backing off the C/C. This yielded a very, very heavy saturation of gold powder which was expected. Held at the right angle relative to the light, the writing looks completely gold. The only surprise here was that the nib "swab" was not quite as saturated. Perhaps the back and forth motion just distributed the gold more evenly across a much broader surface than standard writing. Lastly, this is a picture of the feed after being saturated. Lots of gold near the breather hole. My experience is that it wipes off pretty easily, but will stay there if not wiped. It will smear onto your fingers when touched. The pen is now uncapped and nib down. Further testing tomorrow. Any other ideas? Let me know. Edited by TheRealScubaSteve, 09 November 2014 - 23:10. That looks pretty amazing. I may have to get a sacrificial pen to try this out! 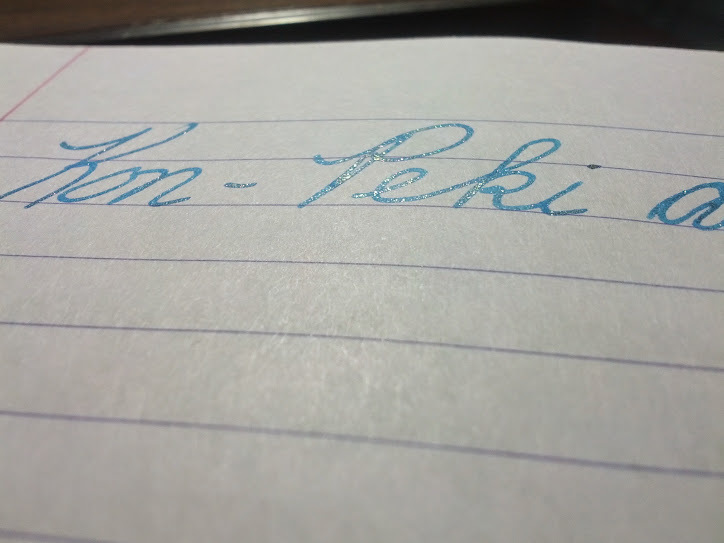 The ink mixture seems to be performing better than expected so far. I was expecting some clogs by now. This is a fascinating test. 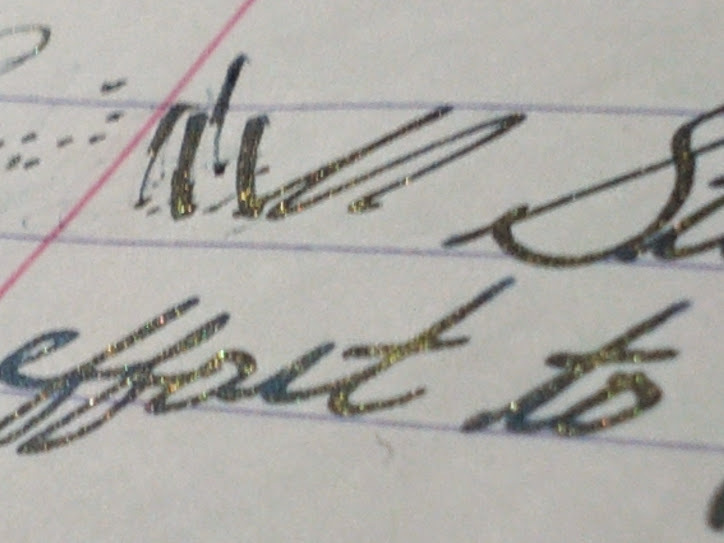 Does the gold material shed if you rub the dried ink that is on the paper? Edited by Medsen Fey, 10 November 2014 - 03:25. Not really. You will get some "sparkles" on your fingers if you rub firmly, but it seems to be pretty well glued in place by the ink. I bought some gum arabic to use, but found it was not needed. 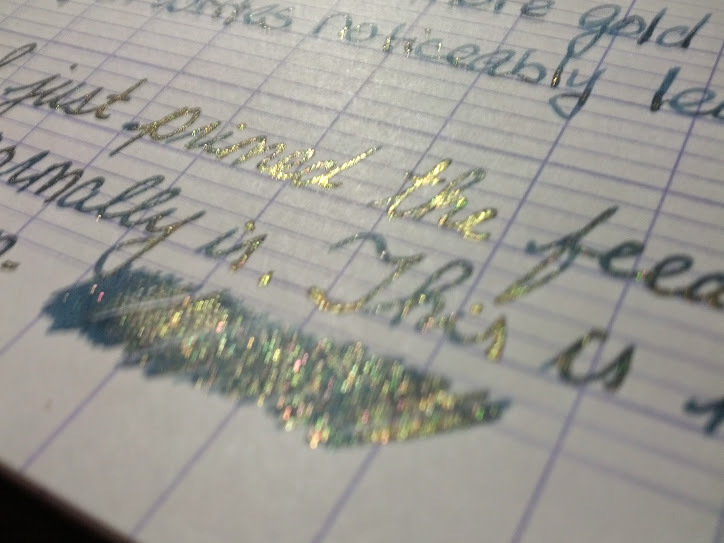 The only instance I found that a lot of gold rubbed off was from an un-splattered drop of ink left to dry on the page. With the gold powder it dried without leveling out much at all. 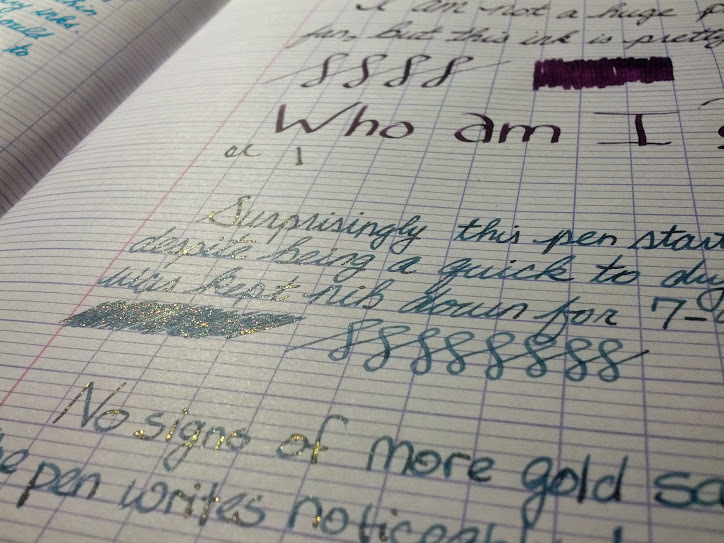 With heavy saturation of gold, sometimes gold flecks will be visible on the previous page where the notebook was closed, but just a few specks here and there. I'm also curious to know if an ultrasonic cleaning will clear all that paritculate matter out? I've order some dust to test this myself. This really looks like fun. Cap was left off and nib down for 20 hours or so. 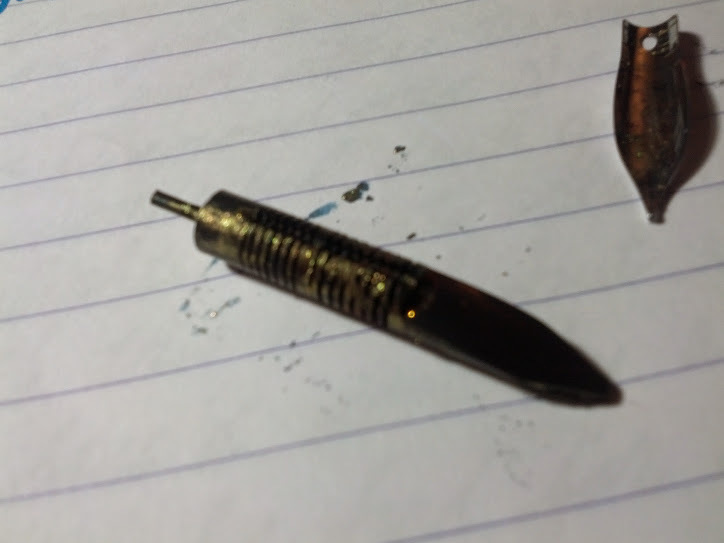 The feed and nib had a lot of gold particles on them, but did not appear to be clogged in any way. I should also note that the gold was still pretty moist so I'll likely need to test (uncapped) for at least 3-5 days to fully dry out the feed. 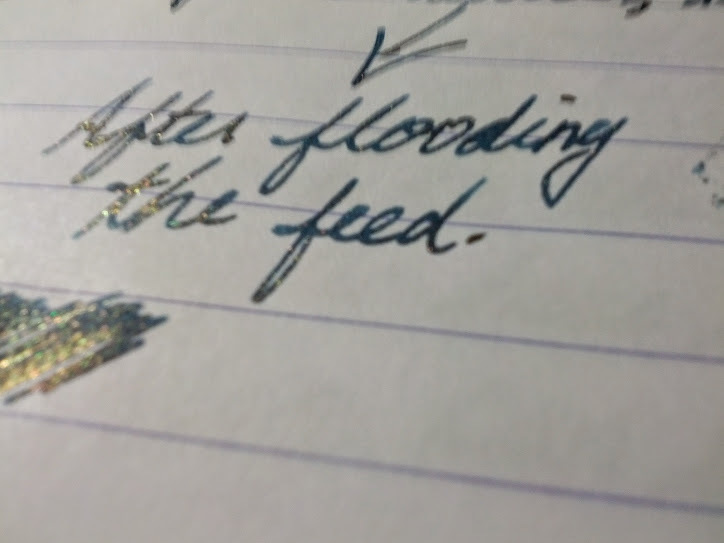 I reassembled without any cleaning and flooded the feed because it would not write. 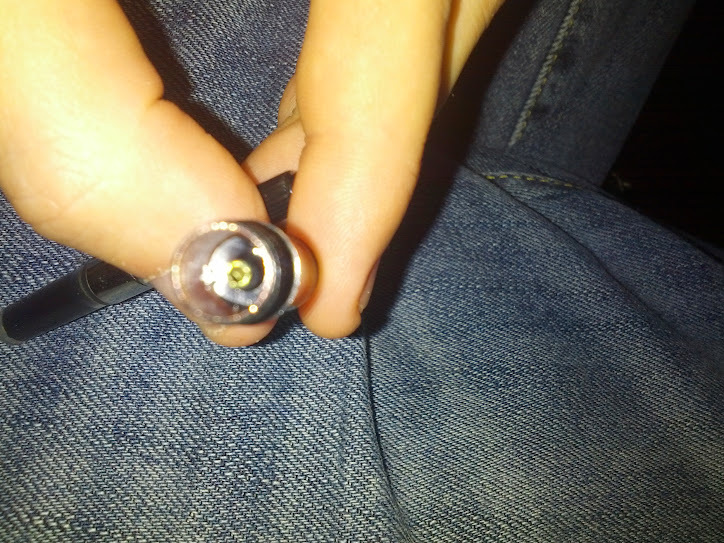 Again, this is a common problem with this pen so the added gold powder should not be blamed for this. 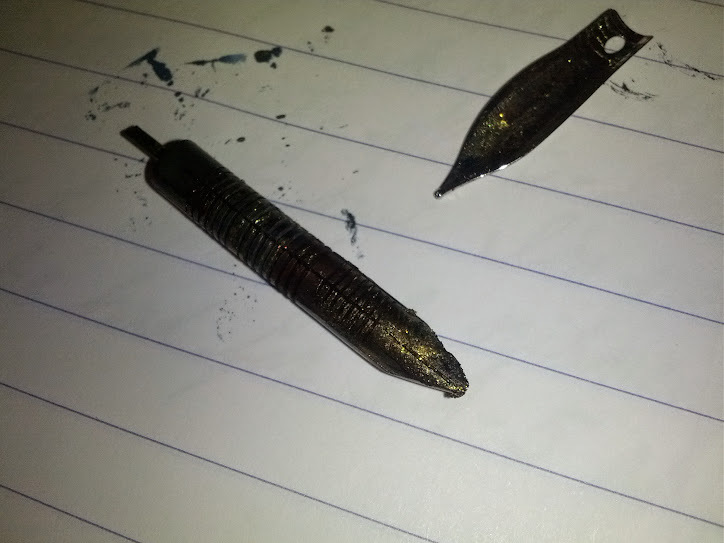 I flooded the pen down to the nib, then sucked the excess ink back into the converter. It did not start right away, but only took two groups of nib taps and a handful of scratches and swirls on the paper. Edited by TheRealScubaSteve, 10 November 2014 - 21:53. I'm not sure as I don't have an ultrasonic cleaner, but I suspect it will not even be needed. 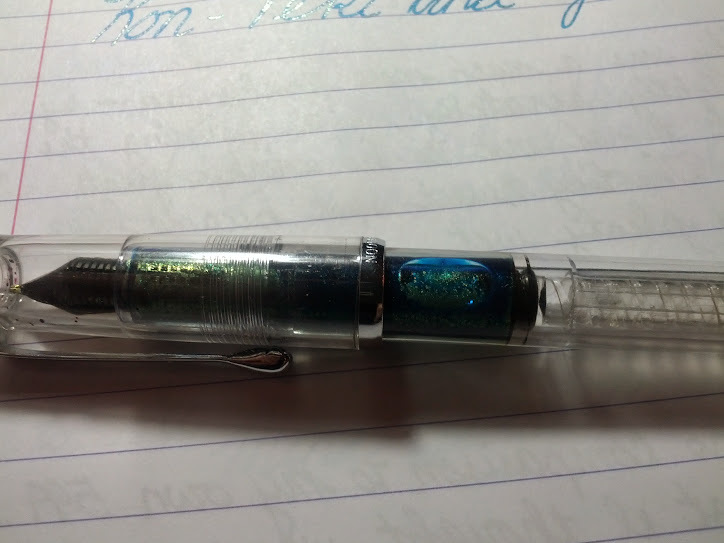 I'm going to leave the Baoer uncapped for several days, attempt to write with it again, and then clean it to see how easy or difficult it is. I'm comfortable enough to try it in a more expensive (but still pretty inexpensive) pen. 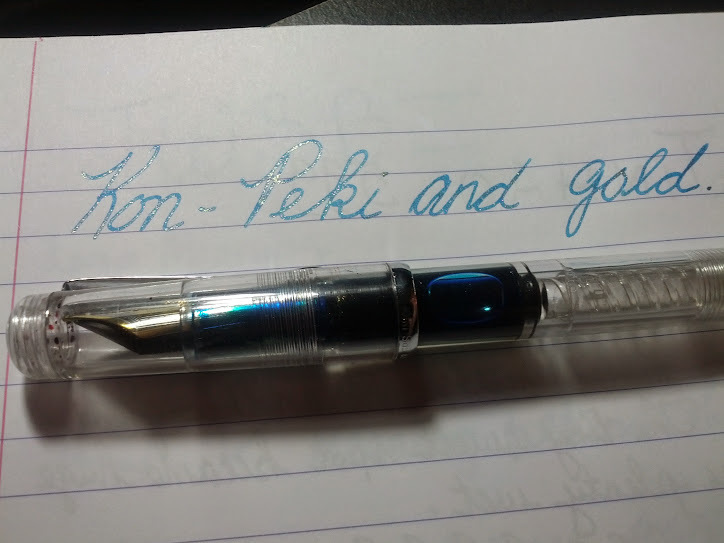 Here's some Kon-Peki (66% water) and not quite as much gold as the first batch in a Noodler's Konrad with Jinhao M nib. It worked well with the flex nib, but I have difficulty in writing with it. Very interesting. I wonder if embossing powder would work as well... It is also super fine. JoAnn Fabric's description does say to add it to ink, but I assume they mean with a dip pen. If I had some I'd try it as long as it was nice and fine. The pictures, though, do not look very metallic so I'm not sure how well it'd sheen. Hm. That's a good point. Now that I think it does have a shimmer at first, but the shine *really* comes out when heat is applied. Did you order the same gold that I linked? I'd like to try some other color for blue and green inks. 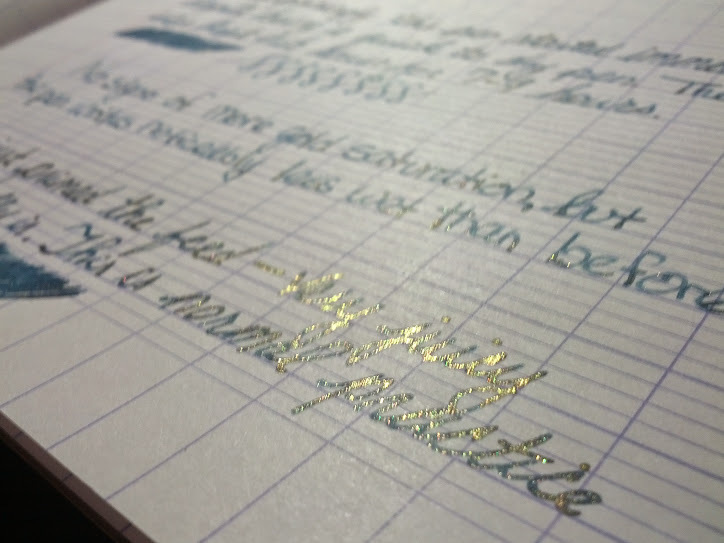 I'm not sure I really like the gold in Iroshizuku K-P.
Yep same stuff you linked, figured that way I knew I was getting something believed to work and the community would get a second opinion to see if the results are reproducible. Not that I disbelieve you in any sense, just can sometimes be good to know it worked similarly for different people in different pens, inks, etc. In hindsight I realized I should have tried to collaborate, I bet a ziplock bag with some powder could make it in a standard envelope. I could have bought a different color and we could have traded some powder. I looked quick since I could still cancel my order, but I really needed the item to be fulfilled by Amazon and eligible for free shipping to round out an order and it looks a lot of them would not qualify because they are not fulfilled by Amazon. No worries - if you find success with it, I'm sure there'll be room for swapping in the future. I have not yet looked for the other colors, but I'll probably go for silver or blue since blue inks are my favorite. Look forward to seeing what you think. 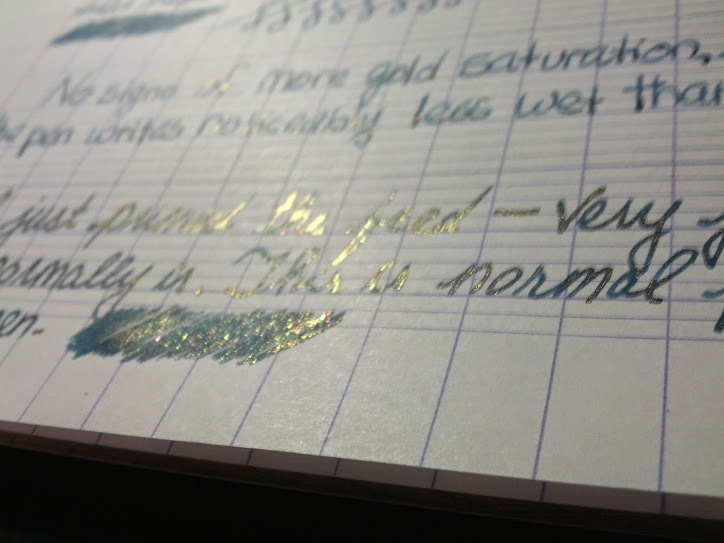 I did have a hard start yesterday with my Noodler's Konrad with a 66% K-P mix, but it appears to be a one-off since today it was fine. 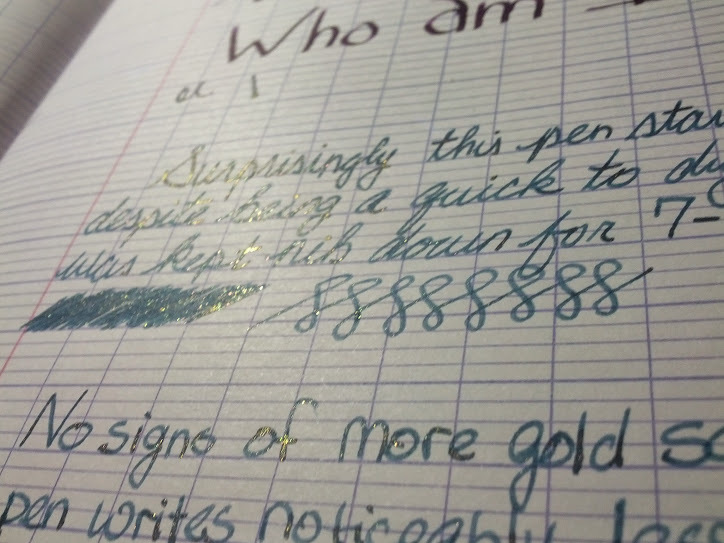 That pen seems to horde gold powder in the section because of the design, but it does not seem like it really effects the saturation unless the pen isn't "stirred."